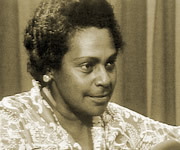 Faith Bandler is a descendant of South Sea Islanders. During the 1950s, she became involved in the peace movement, and in 1956 was instrumental in setting up the Australian Aboriginal Fellowship. In 1974, Faith decided to direct her energies to the 16,000 descendants of South Sea Islanders and, in 1975, made her first emotional journey to her father's birthplace on Ambrym. She was interviewed for Film Australia's Australian Biography series in 1995.